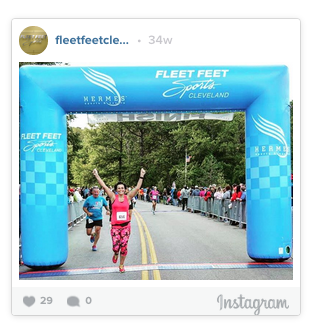 As they say, “the hay is in the barn.” You’ve spent the last months waking up at the crack of dawn or running into the night in rain, sleet, snow and sun [and everything else Cleveland has to offer] to get in your miles. You’ve overcome aches and pains, gritted your teeth through hard workouts and learned there’s no such thing as too much foam rolling. 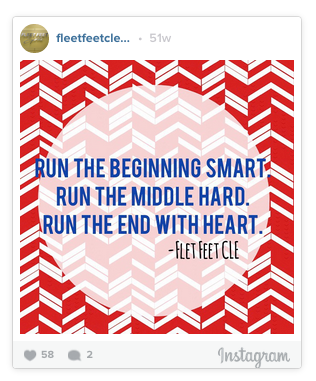 Most importantly, you’ve found new running routes, made new running friends and enjoyed the process. You’ll hear us say it over and over again – “Don’t try anything new on race day.” You know what shoes are just right, what nutrition works for you and what pace you’re comfortable with. Don’t panic, and don’t second-guess yourself. Stick with what you know, and you’ll be just fine. Pre-race anxiety? Forget it! Stressed about nutrition? Don’t be! Worried about your game plan? Stop it! Stressing and worrying at the starting line and during the race is going to make for a miserable day. Take a deep breath and let go of the worry. Know that you are prepared, and if things don’t necessarily go the way you planned, go with the flow. You’ll be a much happier camper when it’s all said and done [and probably take a better finishline photo]. When the going gets tough…well you know what they say. Despite the crowds and friends and family along the course, YOU are your strongest driving force. 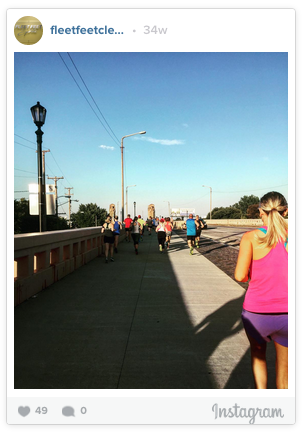 Come up with your own mantra to repeat to yourself during the race (“I can do this!” “I’m strong!” “26.2 miles is nothing!”). Smile—even if you’re not feeling it. The more you encourage yourself, the easier the tough parts will be. Look up and enjoy the miles! Easier said than done, right? But seriously, this is one of the most unique ways to see the city of Cleveland. Take in the scenery that you don’t normally see just driving by in your car. Look around for your friends and family on the course for some encouragement and smiles. Enjoy the crowd of people on the same journey as you and maybe make a friend or two. You won’t regret taking time to enjoy the day. We promise. Ahhhhh. The best part. Have a cold one, hug your friends and family, eat some pizza. Whatever it is that gives yourself a pat on the back for your accomplishments, DO IT! You deserve it. No matter the outcome of the day, make sure you don't downplay what you just did. You just ran a long way, and in our book that deserves a celebration. We are firm believers that no race should go uncelebrated. If you're need celebration advice, we're really good at it. Best of luck, Cleveland. You’ve got this!